A couple of weeks ago I installed a product called EZ Snap exterior RV window shades on several of our Keystone Cougar fifth wheels windows. Rather than do the review right away I wanted to live with the product a little while. 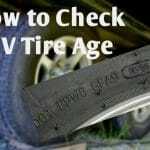 This way we could experience the shades over time during our day to day RVing life and see how they performed in different lighting conditions. The EZ Snap company sent me out an approximately 6′ by 7′ roll of the shade material and plenty of mounting hardware. I was able to cover our large rear window and two smaller slide-out room windows for the review. The way our RV is currently situated we get the late afternoon and evening sun pouring in from the rear. A perfect testing ground for the shade. You can view my full installation post for in-depth details. Overall I found it extremely straightforward. So far the hardware has worked as advertised. 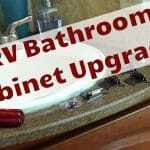 I loved not having to alter the RV side walls by drilling or screws. The last thing I want is more ways for water to get in. 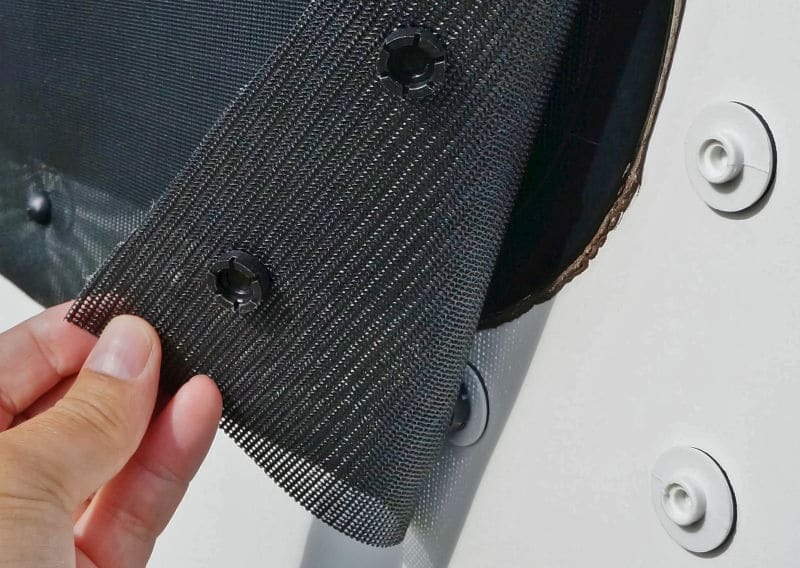 The 3M (VHB) stick-on adhesive studs have remained firmly attached to the RV sidewall. My impression is they will be there for the long haul. 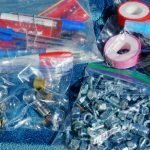 I’ve used similar adhesive to mount bubble levels with good results over time. The plastic snaps hold the shade material in place well, even in heavy winds. 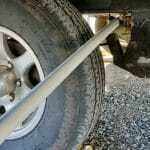 They push on with a positive snapping action and are easy to unsnap with the provided removal tool. The only negative I can say about this method of attachment is it can be a little tedious if you need to remove the shade often. The shading mesh material (Encapsulated Thermo-Weave) appears quite durable with no signs of edge fraying or wrinkles. Cleaning is simple. So far I’ve had to deal with several bird poops. A soft bristle brush and hose spraying quickly did the job. 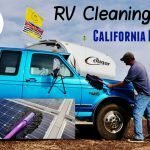 My number one reason for installing window shades is to cut down the interior heating of the RV. For that, I give the EZ Snap shades high marks. They work at least as well or better than inserting Reflectix bubble foil with the benefit of being able to see out. Two more benefits to the new RV window shades are snazzy looks and privacy. The way the EZ Snap mesh sits flush against the window gives the rig a sleek modern look in my opinion. Privacy is a notch above the OEM daytime shades. In bright sunlight, the shade is very dark with little chance for outside folks to know what’s happening inside. Being able to remove the shades versus something like tinted window films is a big plus. There are going to be many times of the year we don’t want to block out the sun. 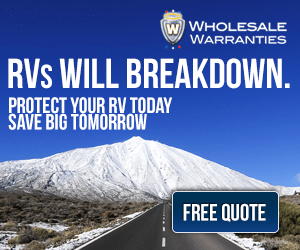 Being full-time RVers, we often find ourselves in colder weather and in those times appreciate the sunlight’s warmth along with the propane savings it brings. 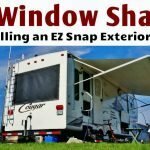 The EZ Snap shades roll up and can be tucked away in a storage compartment adding barely any weight to the RV versus having awnings attached to all the windows. Number 1 Issue – When sitting close to the shade the outside view is too obstructed by the mesh. We bought an RV with large windows so we could enjoy the views. We love to sit with our morning tea/coffee and watch the wildlife or admire the scenery. Number 2 Issue – This one is more from my wife than me. Anne likes, especially in the morning, to have it nice and bright in the RV. The first thing she does when getting up is draw open all the blinds. She found the EZ Snap window shades blocked too much light. I’m the opposite and enjoy a cave-like atmosphere inside the RV so wasn’t bothered as much. 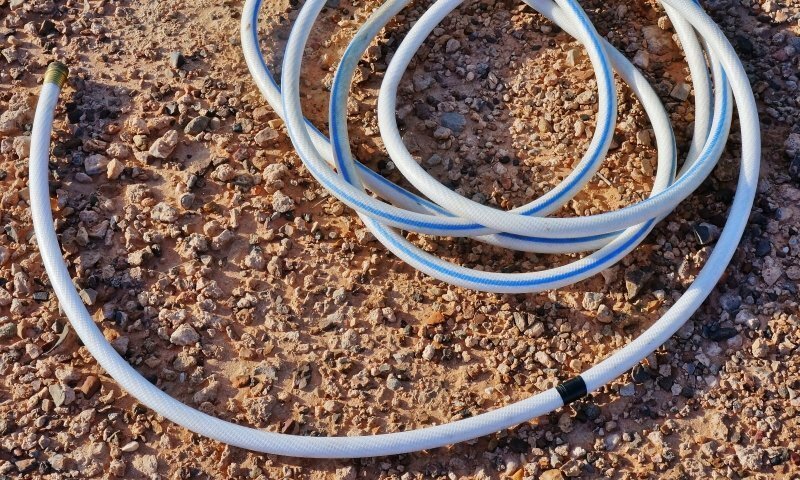 Both these problems are solved by removing the shade in the morning and reattaching later when the sun starts to stream in. However, it is tedious considering the number of snaps that need to be undone. Maybe the issue could be solved with magnetic tabs instead of snaps; I’m not sure. 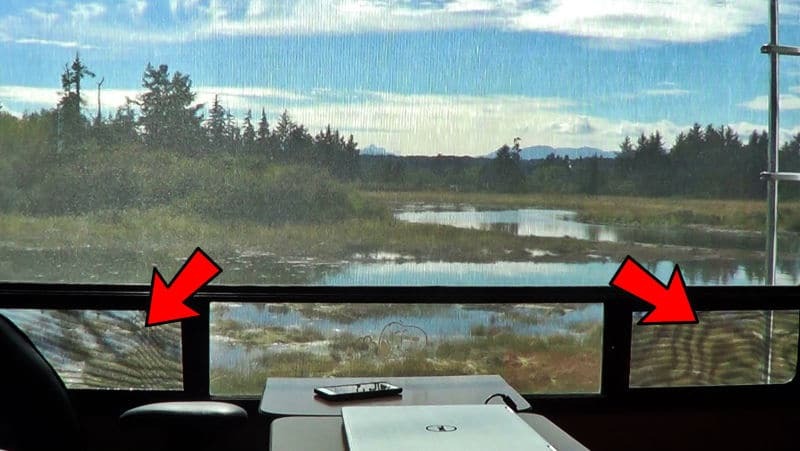 Number 3 Issue – Strange moire pattern develops when the meshed EZ Snap shade material is in front of bug screens. 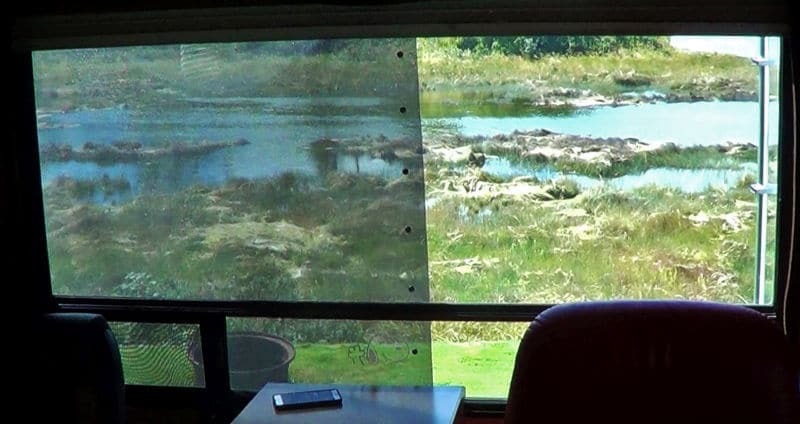 Since all the RV windows have insect screens, it can be annoying to look at. In time our brains may disregard this moire effect, but right now it definitely stands out and worth mentioning. As you can see the shade isn’t without its drawbacks. To be fair though there isn’t any perfect solution out there that I can see. 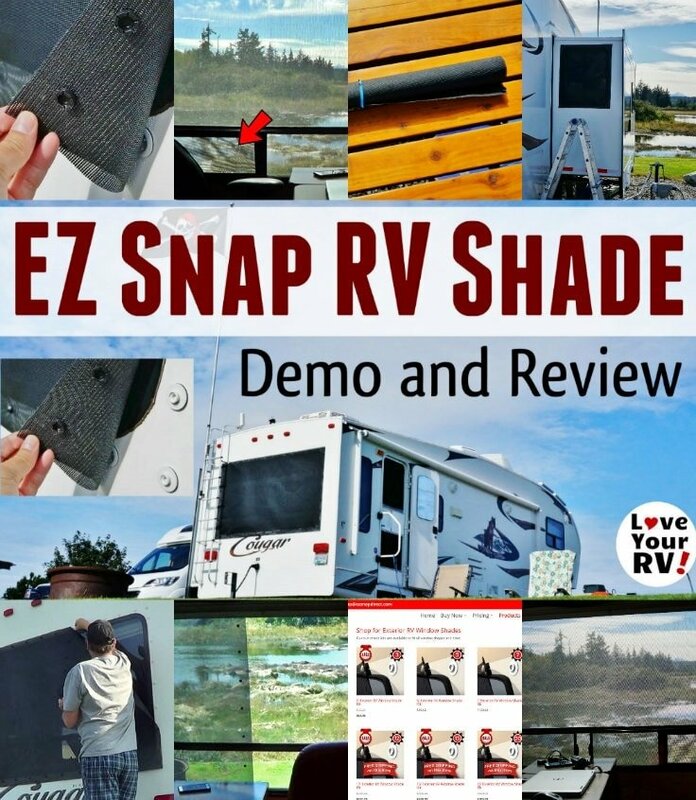 Whether the EZ Snap exterior RV window shades are right for you will depend on how and where you use your particular RV. Along with your personal tastes and habits.